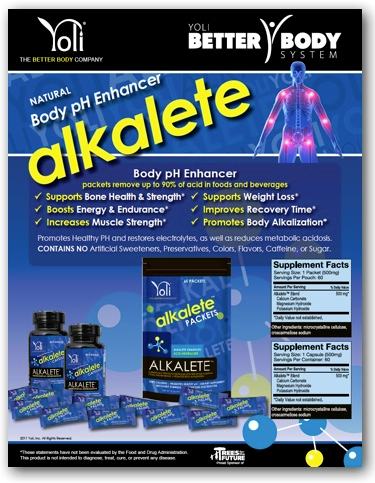 Balance Your PH Levels Alklalete comes in capsules and also in packets so you can sprinkle it on your food and make your food an drinks alkaline. You can test your PH balance with Litmus paper or use ph drops to test the alkalete and see for yourself that alkalete is an easy way to help balance your PH and become alkaline. 53% acid reduction on average. YOLI FUN™, Powered by Alkalete™, is an evolution in performance-enhancing sports beverages. FUN™ is an all natural mineral-charged formula which provides more electrolytes, potassium and magnesium than regular Gatorade™ or Powerade™.Not only for athletes, FUN is perfect for the entire family, both adults and children alike, and you won't have to worry about the dangerous side effects that sugar-laden beverages have over time. 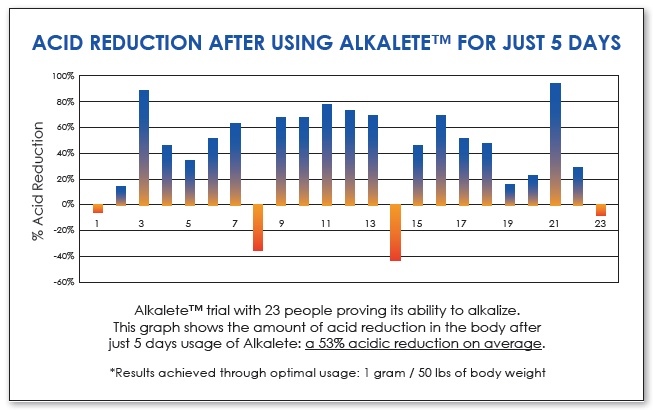 TRUTH™, Powered by Alkalkete and SUPERFRUITS, is an evolution in antioxidant rich health beverages. TRUTH is an all-natural superfruit, vitamin, mineral, enzyme/probiotic and phytonutrient formula containing LIVE, ACTIVE PROBIOTIC INGREDIENTS. We discovered that by using freeze-drying and other patented processes, we could produce powerful powdered blends that keep nutrients bio available without the need for pasteurization, preservatives, chemicals or artificial colors. Yoli TRUTH provides you and your family with natural energy and contains NO caffeine. Your health and appearance is dependant upon the daily nourishment you give your body. The more bio-available antioxidants you and your family get each day, the better you will all look, feel and perform. What is your PH Balance? Are you acidic? It is thought that an acid pH immediately signals the powerful genetic response to an impending famine, directly interacting with the all important and very sensitive, Insulin- Glucagons Axis. This makes the body produce more insulin than usual, and in turn, produce more fat and store it. In general, the more insulin is available to the body, the higher the probability that fat will be produced and stored, rather than used and burned as energy. Thus, an acid pH will probably alert the genetic response to famine, directing more insulin to be produced and storing more fat than usual. Conversely, a healthy, slightly alkaline pH, will be more likely to yield normal fat burning metabolic activity, making no demands on the body to overly produce insulin and make fat, allowing fat-weight to be burned and naturally lost. And, with a healthy pH, there's less likely to be any yo-yo effect, or rebounding from a diet with additional weight gain. As long as nutritional stores are maintained, a healthy, slightly alkaline pH allows fat to burn normally for energy, rather than being hoarded under the mistaken biochemical belief of an impending famine. With increased pressure to produce insulin under the worst conditions, beta cells lose phase with one another, cellular communication is thwarted and the Immune System begins to over-respond. Stress within the cells increases, making it difficult for them to perform adequately, and further, survive. In a very real sense, they simply burn out! Acidosis is thus thought an important yet often underestimated precursor to Diabetes Mellitus. Interestingly, before the advent of synthetic insulin, diabetes was treated historically by buffering the system with base or alkaline causing powders. With acidosis, (pH<7.20) arteries become dilated. Yet, severe lowering of blood pH also causes persistent venous vasoconstriction (a disease in the caliber of blood vessels). When this happens, peripheral blood is shifted more centrally: the more acidic the patient, the greater the fractional redistribution of blood to the central vessels. This central redistribution of blood adds to the heart's workload when its contractibility is compromised. For DNA-RNA synthesis and healthy cell proliferation to occur, cell pH must not be acidic. However, cancerous cells grow well in acidic mediums; therefore an acid pH actually accelerates and increases the possibility of cellular mutations (Cancer). Life-essential functions, like electrolyte Potassium (K plus) and Sodium (Na plus) channels, are inactivated by acidosis. This has far reaching effects cardiovascular, since without sufficient electrolyte management, heart attacks are likely to occur. Without appropriate electrolyte management, our heart literally stops beating. Inhibition of electrolyte activity also affects the way we feel and behave, and is intimately involved in the energy levels we experience, because of the nature of the Na-K Pump and cellular metabolism.